Bell's Liquid Paraffin B.P. - For temporary relief of constipation. 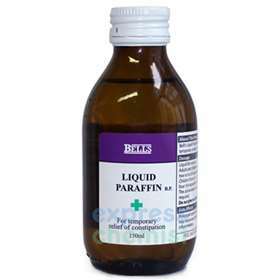 Liquid paraffin is a clear, almost odourless, oily liquid composed of saturated hydrocarbons that come from petroleum. Liquid paraffin works to relieve occasional constipation in two ways, the fatty acids produce an osmotic effect which hydrates the stools. It also works as a stool lubricant to reduce discomfort during bowel movements. Directions for Use: Adults and children over 12 years - Take two to six 5ml spoonfuls. Children from three to twelve - Take one to four 5ml teaspoons. To be given when required. Do not give to children under 3. Do not take if you are pregnant or breastfeeding.